You are here: Home / OS X / What Comes After OS X? The two things that come to mind when people think about Apple are usually the iPhone and a Mac running OS X. The OS X operating system has become tied to Apple more than any product or software so far, but unlike Windows, OS X is both the name of the software as well as the version. For anyone who hasn’t put 2 and 2 together, OS X stands for Operating System version 10, and with the recent release of Mavericks 10.9 the end seems nigh for version 10. This coming end leads us to the question” What comes after OS X? There are a lot of possibilities but a few seem pretty certain. I’ve looked through them all and picked the ones I think are most likely. As with any worthwhile opinion piece, a little bit of history is in order since not everyone out there has every release of OS X memorized. The original public beta of OS X was named Kodiak. This “preview” cost users $29.99 and was a pretty big jump from OS 9. This beta, even though pricy, ceased working in Spring 2001, but allowed users to upgrade to the official version for free, while other users had to pay $129.99. There’s a nice cat name for every other version of OS X all the way up until 10.9 came out and changed things up with Mavericks. No more Panthers or Tigers, but instead a surfing spot in California. Could this name change for 10.9 have been done in preparation for the transition out of OS X and into whatever Apple has for us next? It would make sense for Apple to get that move in naming done now before everything changes, so the transition is done in steps. So we know the change is coming, since Apple can’t make the next version 10.10 (that’d just be Puma again), what will it be? As we mentioned above, Apple named every major version of OS X after some form of feline, making it easier to know what version you were talking about easily without always having to list version numbers. This is a policy that is followed by most UNIX-based operating systems, especially with Linux and their…interesting…kernel naming structure, so it’s a good guess that Apple will continue naming their desktop OS, but the question is what? If we’re going with surfing spots, then could OS XI be Malibu? Or maybe the next OS could be called Newport or Mammoth? I’m hoping we get a Pleasure Point version, myself. The better option for future naming will be famous spots around California, so it’s anyone’s guess what those might be, but I’d be surprised if they stopped naming. I know it’s been talked about before, but with OS X nearing the end of its life cycle, it’s perfect timing to start thinking about merging OS X and iOS. With a completely new major version of Mac OS coming up, and fairly constant major versions of iOS happening all the time, it’s easy to see that a merge could be hiding down he road. The iPhone 5S has a new, extremely powerful 64-bit processor in it, which shows that iOS is ready to run on desktop machines and handle apps with a 64-bit architecture. Right now it’s amazing when a desktop and iOS app work seamlessly with one another, but with a merger of operating systems, this would be the norm. With Apple having so much success with both their operating systems, it makes sense that OS 11 (or Xi, maybe?) could at least use iOS as it’s backbone, similar to how the Apple TV uses iOS but does not look similar to the iPhone OS in the least. 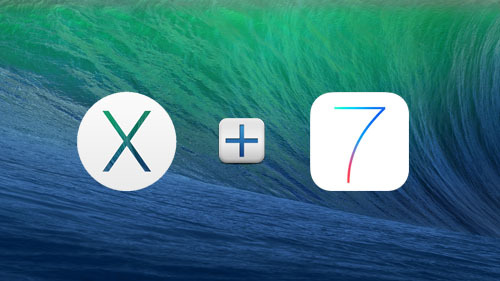 Would I like to see an iOS and OS X merger? Definitely. Do I think it’s a definite? Not at all. The only definite here is that Apple will need to make a somewhat drastic change after OS X 10.9 has run it’s course in 1-2 years and at that time, it’s a complete reboot for the OS. New name, new naming structure, and probably completely new guts. It’ll be a brave new world and I can’t wait to see what comes next. I for one, hope they don’t merge anytime soon. I use both iOS and OS X every day, but for much different workflows. I can’t see a hybrid OS being both robust enough to create websites and still run on a tablet or phone. I just don’t think it’s the right time to merge. Sure sharing features across the two platforms is great and I’d love a little more integration, but making two separate OSes with very different uses into one seems like a bad idea. It’s not working well for Microsoft, so why should Apple do it? I think a merge is a good thing, since they could just skin it to look however they want. The big thing is that being on the same base OS, apps would be shared easier and data would be far more interchangable. I would hate it if they looked the exact same, but some visual cues would be nice. Well, I do want to see a merger, but not in the way you are thinking it would need to be done. First, we have to remember that iOS is, literally, at the core, the same as OS X. Right away, that makes many things much easier to do. But I think the trick would be different. What I can see happening is that Apple would make the two OS’s more compatible inside, rather than the front facing UI. Of course, we’re seeing a merger there as well. And Apple has time to get it right, rather than to go the way Microsoft needed to do in such a hurry. So, what I think can be done is that enough visual, and working elements, of the UI would be similar, to the extent of allowing the software to function with the most features the various devices would comfortably allow. We’re seeing that already. Over the next couple of upgrades of both iOS and OS X we will see even more. But that doesn’t mean that iOS will look like OS X, or OS X like iOS. Just that the functions that make most sense to combine will be done. What that could mean, and to me, it’s the most exiting part, is that we could buy a software package that will install on everything from an iPod Touch to a Mac Pro. But, and this is the big feature, in my eyes, the software would load only that which will work properly on each device. So the simplest UI and feature set would be available in the iPod Touch, and the most on the Mac Pro. Everything else would get something in between, most suitable to the device. The data could be viewed on each device, and appropriate editing functions would be available on each device, based on their capabilities. Through iCloud, the files would be available on every device. So you could do whatever you needed to do on each device seamlessly. This way, while there would be functional and UI elements in common on everything, they would get more sophisticated as you move up the device levels, in a seamless way that doesn’t look or act in a jarring manner, but in a natural way. I hope I decribed this clearly enough. But I do think that Apple is slowly moving towards this idea. If they do it right, it will be far better than what Microsoft is trying to do all at once, but not really, as they have both OS versions there together, in a poorly conjoined fashion. But then, Microsoft really had no choice, and Apple does. Apple has the luxury of taking their time, while Microsoft doesn’t. I agree with what you’re saying completely. Until very recently iOS and OS X weren’t all that similar. OS X was a 64-bit OS while iOS was still only 32-bit. It was with the change in processors with iPhone 5S that things started getting closer. Is it time for the OS to become an AI? This is what my overall point was. I strongly doubt iOS and whatever the desktop OS will be would ever look similar. There is no reason for Apple to merge them in one decisive step. In 1-2 years, the iPad (particularly if it’s a 12″-13″ version) will probably have the computing power only somewhat less than a MacBook Air. An iPad Pro + keyboard, that enables one to handle applications more like a MacBook can, would be an interesting alternative to a MacBook initially because they would still have very different App ecosystems. But in short order, as functionality between iOS and OS X is shared, they will merge. And I’ll be the new ‘laptop’ (or whatever it will be called) will have a market share much higher than the MacBook. In any case, forcibly merging everything for devices ranging from a phone, to a professional desktop, to a laptop/tablet, to other devices not yet shown won’t happen. There will be common code with interfaces appropriate to each device, but with increasingly tight interoperability. I think this is what they were planning all along, since toying with mezzanine slots in the first iMacs, and finally struck a nerve when the iPod took off. I agree that this will come in smaller steps. I’ll just be happy when I can play my iOS games on my Mac. In software naming, things don’t necessarily stop at 10. It is possible to have OS X 10.10 as the next operating system… or even OS X 10.101 (for example: “MediaLink 2.67”). Another alternative is that Apple might decide to eliminate the preceding “10” (which is redundant since the X in OS X is pronounced “ten”). 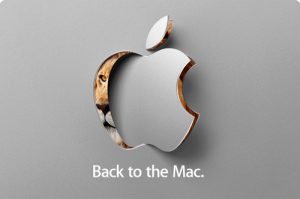 So the current Mavericks would simply be called OS X 9.0, and the next version would be OS X 10.0. That’s correct, as has been argued back and forth for the past few years. It could go to 10.10, 10.11, 10.12, etc. there is no reason wht 10.9 has to be the end. So this article is rather flubby. Basing his idea of where things will go partly on the numbering is nuts! That doesn’t mean it won’t happen. But the numbering scheme will have nothing to do with it. I really can’t imagine the execs. at Apple thinking that since we’re at 10.9 there’s no where we can go with it now, and so we’ve got to change the OS. Crazy! I disagree on it being nuts, personally, but I guess I’m a little biased. I’m saying that Apple could use this as a place to move the two operating systems that have been making the slow creep towards one another happen. Software versioning works so that the next major release after 10.9 can’t be 10.10. Apple uses a version of the NumStrict versioning system, (https://en.wikipedia.org/wiki/Software_versioning#Apple) which means the next release after 10.9.9 would have to be 11. Every other version update has been pretty huge. Just look at OS 9 versus OS X. So, according to you, we will see a fairly radical change in the OS because we’re coming up on 10.10, and Apple is so locked into not going to 10.10, that they will be forced into disgarding the present OS for something different. Really? Numbering schemes are the least important thing to be concerned with. Even if they called the OS something different because of that, it would be the same OS, just upgraded, again. This is such a trivial thing. If they wanted to they could call it OS X 11. 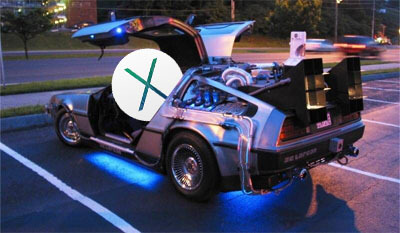 It would still be OS X. Really, numbering is not important enough to force a change in the OS that’s so drastic, and I can’t see Apple making that drastic change in one more step. It will take at least a couple more years, possibly more. The versioning system that Apple uses means that .9 is the last major update in that series. There will be incremental updates but 10.10 doesn’t fit with their system. What are you talking about nearing the end of its life Cycle. Mavericks will be the beginning of the next ten years and on it gores. Never has this OS been so important and so strategic to Apple. I hate it when I see such I’ll formed arguments based on no facts about Mavericks. I’ll have to disagree with you. Mavericks is far from something that would serve as a basis for 10+ years of new development. It’s a great piece of software, don’t get me wrong, but just like with iOS, OS X will need a real refresh at some point. They kinda already are merged. iOS and Mac OS X share so much that to me (as a developer) I can’t see any more integration that would make sense. There actually was a huge amount of shared code in iOS 6 and then also in 7. Sure you could have a compatibility layer on OS X to run iOS apps, but they would be unweildy and not really appropriate for the input methods (mouse, keyboard). Let’s just let OS X be OS X and iOS be iOS. All those article about ‘THE merge’ are so funny and ignorant. That’s one very ignorant claim. It actually goes the other way around, iOS uses OS X as its “backbone”. Always has, and it’s called Darwin. I’d say iOS is at least 80% OS X, the main difference being UIKit vs AppKit (or CocoaTouch vs Cocoa if you prefer) and the drivers. UIKit wasn’t desing for desktop UI and would have some shortcoming, but it does feel more ‘modern’ in some places. AppKit was designed in the late 80′ early 90′. There is practically nothing to merge. All that will happen is they will use ideas from one in the other, and that’s been happening for years now. I’m glad you see my love of Wikipedia! The amount of information there is staggering and I really love sharing it. As for “The Merge,” I know that software-wise they are very close to one another, but my point is that interoperability between iOS and OS X will likely improve. Meaning, I can play iOS games on my Mac and access Mac software on my iPad. With talk of an iPad Pro, a mix of both OS’s would be nice for that platform. Remember when Apple needed Next Step OS to evolve. That came from another company pushing the boundaries of what software & hardware can do that average consumer macs & PCs couldn’t do at the time. Steve Job & Next Step had a full 10 years to create & perfect that system before merging with Apple. I sure wish that Apple had a new 3rd party vendor working on new software that is pushing the boundaries of what todays macs & PCs can’t do yet that that can buy & hire a newer iCEO that can take Apple to newer heights similar to what Steve had done with Apple in the past did. Who remembers when Bill Gates left Microsoft when they were on top of their game & put the bookkeeper/accountant in charge of Microsoft & they stagnated for the last decade without a visionary at the helm. Who was a little disappointed when Steve Jobs had chooses their Bookkeeper to take over as CEO so Apple can begin to soon stagnate as well. Maybe Steve Jobs knew this & he didn’t want anyone or another visionary to out perform what he has build. any comments?